Can an abnormal CT scan be predicted from common symptoms after mild head injury in children? Mild head injury (MHI) is common in children. The exact epidemiology of pediatric MHI is difficult to estimate, as these children are managed by different specialists in different setups. In our head injury registry comprising 7,164 patients, children accounted for 20% of all head injury cases presenting to casualty. Many children after MHI do not receive medical attention. When a child following MHI presents to the casualty/emergency room, it poses a potential problem for the treating neurosurgeon. Most of them may not have any significant injury, but few can have traumatic mass lesions requiring surgery or admission. Because of nonspecific symptoms of MHI in children, it is difficult to decide on the need for a computed tomography (CT) scan. To obviate this decision dilemma, a few clinical prediction rules (CPR) have been developed for MHI in children. An ideal CPR should detect the entire patients at the risk of abnormal CT scan, with a minimum number of scans required to detect one positive case. We aimed at identifying the predictability of positive CT scan from common symptoms after MHI in children. This study was conducted at a tertiary-level referral center for the treatment of neurological, neurosurgical, and psychiatric patients. The center has a separate facility for trauma cases that serves patients from neighboring districts. Patients with head injury are evaluated by neurosurgery residents and data are entered in a structured "head injury proforma", which consists of comprehensive clinical and head CT scan findings. The data are verified by a qualified neurosurgeon on duty. Data of all patients with MHI, defined as Glasgow Coma Scale (GCS) score ≥13, over a period from January 1, 2010, to March 15, 2010, were retrospectively reviewed, and children ≤ 12 years were identified. We chose the cut-off age limit as 12 years because of the policy of government hospitals in India for registration in pediatric department. CT scan findings were confirmed independently from images archived in the picture archival communication system (PACS) of the institute by senior author (DS). We used 15-point Child's GCS for all children. To identify the predictors of our dependent variable "CT scan findings", it was categorized as normal and abnormal. The abnormal CT scan was defined as any skull fracture, cerebral edema, epidural hematoma, subdural hematoma, cerebral contusion, intracerebral hematoma, and subarachnoid hemorrhage. The variables used for the analysis were age, gender, cause of injury (road traffic accident, fall, and assault), loss of consciousness, vomiting, ear or nose bleeding, seizure, and GCS (13, 14, and 15). The analysis was performed in SPSS 15 version (SPSS, Inc., Chicago, IL, USA; Network license, serial number 5047404). Data were expressed using descriptive statistics such as mean, standard deviation for continuous variables, frequency, and percentage for categorical variables. Statistical analysis was done using Chi-square test for categorical variables, and Mann-Whitney U test for continuous variables with 5% significance level. The discriminative ability of mentioned variables in predicting CT abnormality was evaluated using area under receiver operating characteristics (ROC) curve (AUC). A total of 1,628 patients with MHI were evaluated during the study period; of these, 133 children ≤12 years (mean, 5.82 ± 3.05) were identified. [Table 1] presents the general demographic profile of these children. Most of the children were male. 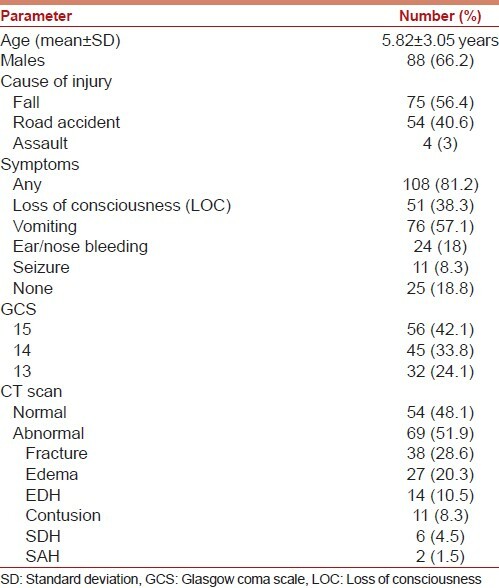 The most common cause of injury was fall, and most patients presented in GCS 15. The common symptoms were loss of consciousness (LOC), vomiting, ear or nose bleeding, and seizure. Other symptoms such as headache, giddiness, vision impairment, speech change, weakness of face or limbs, walking difficulty, and cerebrospinal fluid (CSF) rhinorrhea were absent. The abnormal (positive) CT scan was seen in 51.9% of cases. The most common CT scan finding was skull fracture followed by cerebral edema. Three patients required surgery for the evacuation of epidural hematoma; all of them had at least one symptom. The analysis of symptoms is given in [Table 2]. The presence of any symptom had an odds ratio of 1.80 (95% CI, 0.74-4.37) for a positive CT scan, but it was not significant. Among all symptoms, ear or nose bleeding had the highest odds ratio of 2.11 (95% CI, 0.83-5.34) for a positive CT scan, but it was not significant. The most common combination of symptoms was loss of consciousness and vomiting. Even the combination of symptoms was not significantly different in children with normal or abnormal CT scan. The estimates of symptoms and the AUC for the prediction of an abnormal CT scan are given in [Table 3] and [Table 4]. The sensitivity of presence of any symptom is good, but specificity is poor for abnormal CT scan. The AUC for any symptom was 0.545 (95% CI, 0.446-0.643), which is poor [Figure 1]a. The AUC for individual symptoms was also poor [Figure 1]b. To obviate unnecessary CT scans, many guidelines are available for indication of CT scan for MHI in adults. Among these, Canadian CT Head Rule (CCHR) is the most widely validated rule, with a sensitivity of 99-100% and a specificity of 48-77%. ,, A few CPR are available for the need for CT scan in children with MHI. ,,,, These rules differ considerably in population, predictors, outcomes, methodologic quality, and performance. Many of them are not validated in a separate population, and their impact on practice has not been assessed. No single CPR is applicable to all patients. The range of sensitivity, specificity, negative predictive value (NPV), and positive predictive value (PPV) of these rules are 95-100%, 26-87%, 99-100%, and 5-12%, respectively. ,, The highest quality CPR for children with MHI are the Canadian assessment of tomography for childhood head injury (CATCH), Children's head injury algorithm for the prediction of important clinical events (CHALICE), and Pediatric Emergency Care Applied Research Network (PECARN). ,,, The symptoms and signs included in these CPR, with a decreasing order of probability of intracranial injury, include depressed or basal skull fracture, focal neurological deficit, coagulopathy, post-traumatic seizures, previous neurosurgery, visual symptoms, bicycle and pedestrian motor vehicle accident, loss of consciousness, vomiting, severe or persistent headache, amnesia, GCS < 14, intoxication, and scalp hematoma/laceration. The dependant variable abnormal (positive) CT scan in these rules included the following CT scan findings: Skull fracture, epidural hematoma, subdural hematoma, subarachnoid hemorrhage, intraventricular hemorrhage, cerebral contusion, and cerebral edema. Few rules also defined significant injury as any CT scan finding that may require neurosurgical intervention, intracranial pressure monitoring, or admission to intensive care unit. In our patient population, only four symptoms were present: Vomiting, loss of consciousness, ear or nose bleeding, and seizures. We did not include scalp injury as a variable because it has little diagnostic value. We do not perform coagulation profile for patients with MHI at our institute; hence, we did not include this variable. Post-traumatic amnesia (PTA) is also an important predictor of abnormal CT scan. The emergence from PTA is difficult to assess in children; hence, we did not include this variable. We included all CT scan findings listed above as inclusion criteria for abnormal (positive) CT scan. We did not define separately significant intracranial injury. We did not include the need for surgery as a dependant variable since we had only three cases requiring surgery. The analysis of symptoms revealed slightly different estimates for the positivity of CT scan as compared to literature. The sensitivity and negative predictive value were less in our study. This means that one cannot reliably rule out the possibility of an abnormal CT scan in children with MHI without any symptoms. Our study had certain limitations. The patient profile in our study included only the patients who underwent CT scan. We do not have the estimate of other children with MHI who did not undergo CT scan. We did not have as many patients in GCS 15 as in other studies; this itself shows a referral bias. We also had a higher rate of abnormal CT scan than other studies. The probable reason for higher positivity was inclusion of skull fracture, which was not included in other studies. ,,, However, in spite of these limitations, our study answers one important question for neurosurgeons. A child with MHI presenting to a neurosurgeon should undergo CT scan if he/she has any of the following symptoms: Vomiting, loss of consciousness, ear/nose bleeding, and seizures. A child with MHI without any symptoms may require a CT scan depending on the clinical acumen of the evaluating neurosurgeon. A good clinical judgment based on experience is a better strategy than CT scan for the all versus discharge-all approach. Based on our study, one cannot reliably rule out an abnormal CT scan in a child with MHI; hence, a policy of liberal CT scan is advisable. The immediate benefits of CT outweigh the remote risk of cancer in many circumstances. The diagnostic accuracy and speed of scanning cannot be replaced with any other modality, and it will be in practice worldwide. 2. Maguire JL, Boutis K, Uleryk EM, Laupacis A, Parkin PC. Should a head-injured child receive a head CT scan? A systematic review of clinical prediction rules. Pediatrics 2009;124:e145-54. 3. Shukla D, Devi BI. Mild traumatic brain injuries in adults. J Neurosci Rural Pract 2010;1:82-8. 4. Kirkham FJ, Newton CR, Whitehouse W. Paediatric coma scales. Dev Med Child Neurol 2008;50:267-74. 5. Levin HS, Hanten G, Roberson G, Li X, Ewing-Cobbs L, Dennis M, et al. Prediction of cognitive sequelae based on abnormal computed tomography findings in children following mild traumatic brain injury. J Neurosurg Pediatr 2008;1:461-70. 6. Holmes JF, Borgialli DA, Nadel FM, Quayle KS, Schambam N, Cooper A, et al. Do children with blunt head trauma and normal cranial computed tomography scan results require hospitalization for neurologic observation? Ann Emerg Med 2011;58:315-22. 7. Pearce MS, Salotti JA, Little MP, McHugh K, Lee C, Kim KP, et al. Radiation exposure from CT scans in childhood and subsequent risk of leukaemia and brain tumours: A retrospective cohort study. Lancet 2012;380:499-505. 8. Stiell IG, Wells GA, Vandemheen K, Clement C, Lesiuk H, Laupacis A, et al. The Canadian CT Head Rule for patients with minor head injury. Lancet 2001;357:1391-6. 9. Stiell IG, Clement CM, Rowe BH, Schull MJ, Brison R, Cass D, et al. Comparison of the Canadian CT Head Rule and the New Orleans Criteria in patients with minor head injury. JAMA 2005;294:1511-8. 10. Pandor A, Goodacre S, Harnan S, Holmes M, Pickering A, Fitzgerald P, et al. Diagnostic management strategies for adults and children with minor head injury: A systematic review and an economic evaluation. Health Technol Assess 2011;15:1-202. 11. Palchak MJ, Holmes JF, Vance CW, Gelber RE, Schauer BA, Harrison MJ, et al. A decision rule for identifying children at low risk for brain injuries after blunt head trauma. Ann Emerg Med 2003;42:492-506. 12. Haydel MJ, Shembekar AD. Prediction of intracranial injury in children aged five years and older with loss of consciousness after minor head injury due to nontrivial mechanisms. Ann Emerg Med 2003;42:507-14. 13. Atabaki SM, Stiell IG, Bazarian JJ, Sadow KE, Vu TT, Camarca MA, et al. A clinical decision rule for cranial computed tomography in minor pediatric head trauma. Arch Pediatr Adolesc Med 2008;162:439-45. 14. Pickering A, Harnan S, Fitzgerald P, Pandor A, Goodacre S. Clinical decision rules for children with minor head injury: A systematic review. Arch Dis Child 2011;96:414-21. 15. Osmond MH, Klassen TP, Wells GA, Correll R, Jarvis A, Joubert G, et al. Pediatric Emergency Research Canada (PERC) Head Injury Study Group. CATCH: A clinical decision rule for the use of computed tomography in children with minor head injury. CMAJ 2010;182:341-8. 16. Dunning J, Daly JP, Lomas JP, Lecky F, Batchelor J, Mackway-Jones K, et al. Children′shead injury algorithm for the prediction of important clinical events study group. Derivation of the children′s head injury algorithm for the prediction of important clinical events decision rule for head injury in children. Arch Dis Child 2006;91:885-91. 17. Kuppermann N, Holmes JF, Dayan PS, Hoyle JD Jr, Atabaki SM, Holubkov R, et al. Pediatric Emergency Care Applied Research Network (PECARN). Identification of children at very low risk of clinically-important brain injuries after head trauma: A prospective cohort study. Lancet 2009;374:1160-70. 18. Lyttle MD, Crowe L, Oakley E, Dunning J, Babl FE. Comparing CATCH, CHALICE and PECARN clinical decision rules for paediatric head injuries. Emerg Med J 2012;29:785-94.